HDMI(High-Definition Multimedia Interface) 및 DVI(Digital Visual Interface)는 고선명 디지털 전용 비디오를 전달하기 위해 순수한 디지털 형태로 데이터를 전송하여 가장 밝고 정말한 색상과 섬세한 세부내용을 전달합니다. 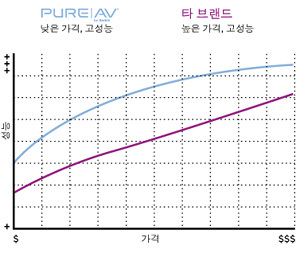 PureAV HDMI-DVI 및 DVI듀얼 링크 케이블은 우수한 품질의 디지털전용 고선명 비디오를 전달합니다. 이 케이블은 은도금 도체, 5중 차폐 및 정밀한 가공 절연 소재를 사용하여 섬세하고 세밀하며 실감나는 영상을 전달합니다. DVI기술에서 최상의 해상도를 얻으려면 듀얼링크 24핀 연결을 사용해야 합니다. 듀얼링크는 실글링크만 사용할 수 있는 기존의 AV하드웨어와도 호환되어 편리합니다. 하지만 듀얼링크만 1080p 신호를 전달 할 수 있습니다. High-Definition Multimedia Interface (HDMI) and Digital Visual Interface (DVI) deliver the brightest, most accurate colors and sharpest detail by transferring data in pure digital form to deliver true high-definition, all-digital video. HDMI is backward-compatible with DVI, allowing connection of HDMI-capable components and displays to equipment with DVI connections. HDMI-to-DVI is ideal for connecting digital displays such as HDTVs, plasma displays, LCD TVs, and projectors to digital source devices, such as DVD players/recorders, digital set-top boxes, and AV receivers. To obtain the highest-possible resolution from DVI technology, a dual-link, 24-pin connection is required. Dual-link provides the convenience of backward-compatibility with AV hardware that is single-link-enabled only. 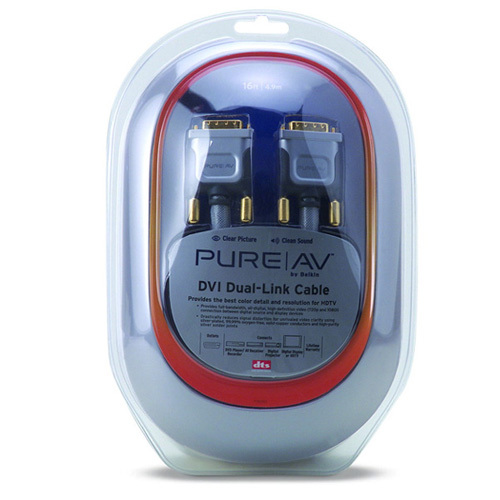 PureAV HDMI-to-DVI and DVI Dual-Link Cables deliver superior-quality, all-digital, high-definition video. They use silver-plated conductors, five-layer shielding, and precision-formulated dielectric material to ensure a sharp, detailed, vibrant picture. PureAV의 PCOCC공정은 매우 우수한 전송 특성을 갖는 단일한 동 결정을 만들어 표준 OFC에서 발생하는 왜곡을 혁신적으로 줄여줍니다. 결과적으로 보다 깨끗하고 선명한 사운드와 선명하고 좀 더 실감나는 화질을 얻을 수 있습니다. 비디오 케이블의 경우, 은도금 처리되어 있기 때문에 일반 동선보다 월등한 전도율을 나타내는 PCOCC 도체를 사용하면 최고의 고주파수 응답성을 얻을 수 있습니다. 비디오 신호는 대부분 고주파이므로 기본적으로 은도금이 처리되어 전도율이 높은 표면을 통해 신호가 전달됩니다. 은도금은 신호를 손실없이 원활하게 전달하여 보다 선명하고 풍부한 색상을 만듭니다. 납은 케이블과 커넥터를 연결합니다. 은납을 사용하면 전도율이 높아져서 화상과 오디오의 품질이 향상됩니다.